"Metamorphosis of Identity" opens in Butler's Erman B. White Gallery of Art. Butler Community College’s Art Department is hosting “The Metamorphosis of Identity.” This exhibit, which focuses on the evolution of human identity runs from Nov. 10 - 30 in the Erman B. White Gallery of Art. The show will feature a variety of media, including photography, prints, paintings and sculptures. Angelia Perkins, a Butler Community College graduate, is the guest curator for this show. Perkins attended the University of Kansas where she studied painting, printmaking and sculpture. Currently, Perkins holds a master’s degree in Art Education and teaches high school photography at Lawrence High School. 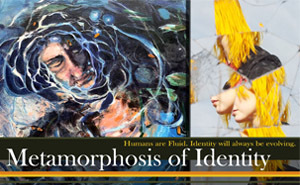 A “Metamorphosis of Identity” reception will be held from 6 - 8 p.m. on Nov. 17 in the E.B. White Gallery, located in the 700 Building of Butler’s El Dorado Campus. For additional information about the show, contact Trisha Coates at tcoates1@butlercc.edu or 316-200-5986. The E.B. White Gallery is open to the community from 10 a.m. - 4 p.m., Monday-Friday. The gallery will be closed for Thanksgiving Break, Nov. 22 – 26.